You’ve probably had that feeling of needing to get out into nature when things get a bit much. Or is that just me? There are many ways in which it can help with your emotional, mental and physical health. It helps you to focus on the positives of your life. Some studies show that it can affect our ‘broodiness’ state. Not the one where we’d like to produce mini me’s, but the mood which has us dwelling on the same unhelpful thoughts. Sometimes called a broken record. These tips will inspire you to get moving. 7 TIPS THAT WILL GET YOU REACHING FOR YOUR WALKING BOOTS AND A RAIN MAC JUST IN CASE! It’s free! Apart from the odd parking charge, getting out into nature is relatively low cost compared to a gym membership. So ditch the contract and find your nearest park or wood. It boosts your energy levels. So when you really don’t feel like going for a walk, the best thing to do is go for a walk! Fresh air will reawaken your brain. Reconnecting with nature reduces stress and calms your nerves. It can lower concentrations of cortisol, lower pulse rate and blood pressure. It will lift your spirits! Exercise and peace and quiet will lift your mood, and in some cases can help with mild to moderate depression. Trees naturally give off something called ‘phytoncides’ or ‘wood’ essential oils, which have a beneficial effect on our nervous systems. Walking through green spaces can create the calmness needed for reflection. It’s in this calm, quiet reflective state that creativity can flourish. It can help to talk through a problem, laugh and spend time away from work and daily struggles. This is easier to achieve without all the usual distractions like social media, colleagues, noise and chaos. TAKING A MINDFUL WALK IN NATURE WILL ENHANCE THE BENEFITS EVEN MORE. 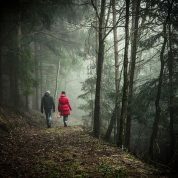 HERE ARE SOME IDEAS FOR HOW YOU CAN BRING MINDFULNESS INTO YOUR WALK.Walking slowly and taking in everything that your senses can pick up will support bringing you in to the present moment, helping you to dissolve all your cares and worries. Listen to the insect and animal sounds, observe the movement of the grass, smell what scents are carried on the breeze. Find a space, which has plenty of trees, plants or flowers. Find something that you are attracted to and observe it in the smallest of detail for 5 minutes. Imagine that you are an insect or wild animal and what it would be like. What would you be aware of? Gather natural elements from your walk; feathers, leaves, twigs and flowers. Make yourself a gift of expression as a memory of your walk. Have fun with it like a child, rather than making something to impress. Forest Holidays offer several locations including accommodation packages. Great news if you already enjoy a walk in nature. And if you’re looking for something that is good for your all round wellbeing, that you can do all year round, don’t want to get sweaty or pull a muscle in the gym, why not start walking today.